Session 330. Our last session for the weekend was a good one. 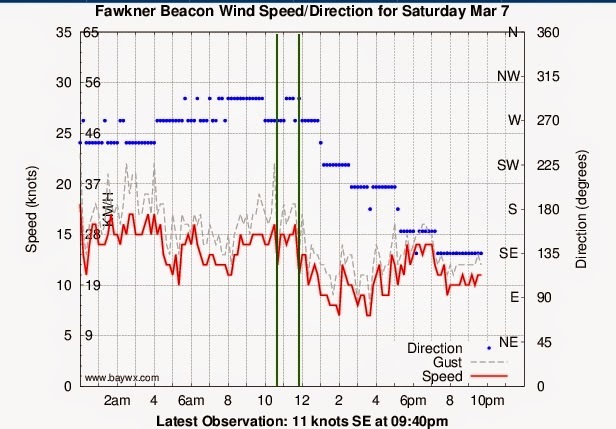 The forecast wind came in at 5p.m at around 15 knots. I had a great session on the Flite 14.5 and the Sector 60. There was enough water to cover the sandbars so I could go fast and not worry about the long fins hitting the sand. I did some nice jumps, hauling the considerable bulk of the Sector 60 out of the water. The kite was easy to handle in 15+ knots, I depowered it a bit too. With the Sector I could bear off down wind to get some deeper water then cut back upwind to get back. No back rolls though . . . Overall, a great weekend again. Inverloch really is a great location for kitesurfing. Having a range of kite sizes helps too. Session 329. No wind in the morning so we headed for the Inverloch surf beach where a good swell was rolling in. I inflated both SUPs - the Starboard 8' and the Naish Nalu 11'. The Nalu is much easier to paddle but it doesn't turn so well on a wave. Catching waves is tricky - getting the balance forward then back is difficult. After lunch, there was very light wind in the afternoon so I thought I would try the Flite 14.5 and the Sector 60. Getting started was tricky but once going the apparent wind was good so I could cruise. I kited down past the jetty, wondering if I could make it back. I spotted a beach that I could land at, then turned around. Surprisingly, I was able to stay upwind but when I reached the pier the wind dropped right out. I did a self rescue, winding in the lines and swimming to the narrow beach with the current slowly taking me out. I made it to shore and was greeted by Stuart and Mike who had driven down to pick me up. Great valet service! I estimate the wind was around 8 knots while it lasted, so this is now my best light wind combo. The Sector 60 is easy to handle with the Flite. I pumped the kite up again back at the Angling Club beach to dry it out and wait for better wind - which came in for the next session. Session 328. When the picked up around 4 p.m, I swapped to the Flite 14.5 and the Nugget for a really good session. Well powered, but really easy to stay upwind. The kite turns really well and delivers good power but not too much. It has really good de-power range too. I did several backrolls, some with kite loops, and landed most of them. I am really enjoying these as they add to the challenge. I must be pulling on the back hand to get the backloop, so now I need to try pulling more on the front hand. Landing a back roll kiteloop is a lot of fun. Everyone was whizzing around, the travails of earlier light wind forgotten. Trent was down with a large crew from SHQ too but there was plenty of room for us all. We were all really pumped at the end of the day. The counter tea at the pub went down really well afterwards. Session 327. Another kitesurfing weekend with the crew, yeah! The dodgy forecast earlier in the week improved closer to Friday to our relief. We headed down to Inverloch early on Saturday morning with our usual stop at the excellent Kilcunda General Store cafe. There was some very light wind around noon so I decided to give the Zero another go while the others pumped up my Flite 14.5 as well. I got going o.k, just, but found the now familiar problem of staying upwind, even on the trusty Nugget. In light winds working really hard I can just hold ground. If the wind gets stronger you have too much power and get pulled off your edge downwind. Its hard to slow down to. Coming into the beach I misjudged the distance and the time needed to slow the kite, came in a bit hot and leaped to the shore. I managed to scratch the top of my foot on something and got it a bit bruised. Not enough to stop me kiting though. There were a few kites down in the patchy wind so I landed the Zero and pumped up my new Naish Nalu inflatable SUP and headed out to assist. Stu Styles was floating and drifting up into the inlet with the strong tidal current. I got to him and pulled him to the nearby sandbar. Meanwhile Eric was taking ages to relaunch the Flite from a sandbar but just as I got to him he relaunched and was on his way. Session 326. The forecast looked a bit iffy but around 15 knots came in later in the morning. I met Stuart and Tarren at Gnotuk Ave, they had gone downwind a bit and were walking up the beach. At last! Good conditions to try out my Ocean Rodeo Flite 14.5 on the water. It was great. Good power, but not too much, I was able to get some good speed, go upwind without difficulty, surf some waves and do some backrolls and kiteloops. The kite is predictable, stable and turns well for its size. I did several back rolls and landed a few. I noticed on a couple the kite ended up pointing in the opposite direction so I must be pulling on the rear of the bar to turn it. I did some backroll kiteloops too and landed one very nicely. Its easy to tell when you have done one, the lines are not twisted when you finish. 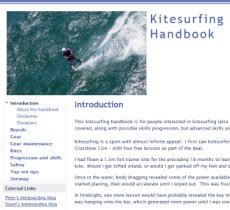 I crashed the kite a couple of times and relaunched it with easy. Then I crashed and jellyfished it (on its back) but got it relaunched, with Tarren assisting by bring my board closer. The Flite 14.5 is easy to relaunch. Stuart had a go on my Sector 60 to go better upwind. I had a couple of runs on it to finish too when the wind dropped out. Overall verdict on the Ocean Rodeo Flite 14.5: Recommended. Turns well, goes upwind well, and is very stable to fly. We had a good coffee and lunch at the Peppercorn Cafe in Mordialloc, a favourite after kiting stop for me. Session 325. 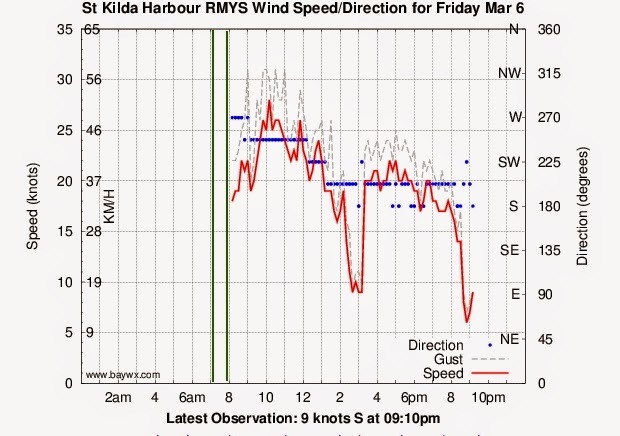 We got to St Kilda just before 7am and the forecast wind was there! It was a bit over 20 knots so I pumped up as the sun was rising with the big ship at Princess Pier lit up in the distance. It was great on the water, we had it all to ourselves, which is remarkable when you consider how many hundred kiters can be out at the same place in a warm summer sea breeze. I was going well on my Lithium 9 and the Nugget in the small surf and did one tack out past the sea wall, then back around inside it. The others headed into the kiddies pond. I threaded through the yachts to then decided the wind was too soft so I headed back out to the surf. I did a few backrolls, but now I seem to backloop the kite at the same time without even trying too. I land well powered but it feels good. I have got to suss out what is going on, maybe I am pulling back with my rear hand to do the loop without really trying to. The wind backed off a bit after 40 minutes so I headed in, leaving Stuart, James and Tarren at it. Parked the car in South Melbourne then cycled to work on my folding bike. A great way to start the day!